Model railroad ballast is available for purchase in your local hobby shop or online in a variety of sizes and colors. Choose the size and color that are appropriate for your scale, locale and to complement the colors of your scenery. Many real railroads use the rocks available in the local area as ballast, so it’s good to know what color ballast your prototypical railroad uses for their tracks in the area you are modeling. If you’re freelancing, this won’t matter much and you can just pick whatever color of model railroad ballast that looks good with the rest of your scenery. If you don’t like any of the colors that are available, you can mix the different colors together to get the shade you want. Experiment with this first using small amount of the ballast, e.g., 1 teaspoon of one color mixed with 1 teaspoon of another color and see if the blend is what you are looking for. If so, then blend larger amounts together in the same proportion to use on your layout. 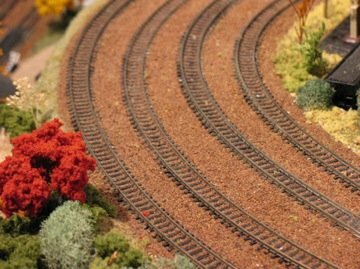 You may wish to vary the shade of model railroad ballast you use in different areas of your layout. For example, you may use a darker shade around freight yards or engine servicing areas than you would on the mainline between towns. I wouldn’t use too many different shades or colors on the same layout however. When you’re finished fixing your model railroad track to your subroadbed and painting the rails and ties, you’re ready for ballasting. Use a small teaspoon to hold a small amount of dry ballast directly over the track and gently tap the opposite edge of the spoon with your finger with the spoon tilted so that the ballast sprinkles out of the spoon a little at a time. Work in small sections of track at first. Sprinkle the ballast over the inside of the rails first, then over the outside of the rails. The outside edges of the ballast should be neat and straight. After you have sprinkled the ballast on a section of track with the spoon, take a medium or soft brush to spread the ballast in and around the ties both on the inside of the rails and out. Again, keeping the outside edges neat and straight. Ideally, none of the ballast should be on top of the rails, just in between them. This is difficult to do with N or Z scale, but do the best you can. You can then proceed on to the next section and do the same. Avoid getting any ballast around the points or mechanisms of turnouts. If this happens, vacuum the ballast out of that area. After you’ve put down the ballast on a few feet of track and after you have groomed the ballast the best you can with a brush, then you’re ready to glue it down. Use a pipette to draw up the glue mixture and then hold the tip of the pipette close to the center of the track between the rails. Gently drip the glue mixture onto the ballast and allow the glue to seep into the ballast slowly. Continue to drip the glue in until you see the white glue saturating the ballast but not enough to cause pooling. The glue should seep and wick its way out from the center to the outside of the rails from underneath. You’ve added enough when you see the ballast on the outside of the rails become saturated with the white glue.You can then continue the same process along the next sections of track. If the ballast gets accidentally moved from where you placed it, use the brush or your finger to move it back in place. Do not get the glue or ballast anywhere near the points or mechanism of your turnouts. Use a soft cloth or sponge on top of the rails to clean off any glue that may have landed there, being careful not to disturb the ballast. Allow this to dry overnight. The white glue will no longer be visible and the ballast should be firmly glued in place. Check your track carefully to be sure none of the model railroad ballast has been glued to the inside of the rails, which will cause a derailment. Also check your turnouts to be sure they still work. Clean off any glue that may have dried on the insides or tops of the rails. From "Model Railroad Ballast" to Model Railroad Track"
From "Model Railroad Ballast" to "Homepage"